Established in 1952, Valco Melton is recognized as one of the world’s leaders in hot melt glue and liquid adhesive dispensing systems. To date, Valco Melton is one of the fastest growing hot melt system manufacturers in the world. 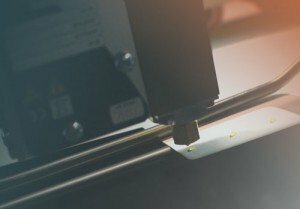 They are re-thinking the traditional approach to hot melt application and are true industry innovators leading the field with their revolutionary advances in hot melt technology. 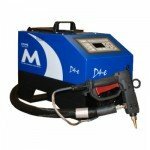 Valco Melton offers a unique design which utilizes a gear-pump driven by an electric motor to eliminate the need for a constantly pressurized system, allowing for perfect adhesive output and pattern control. 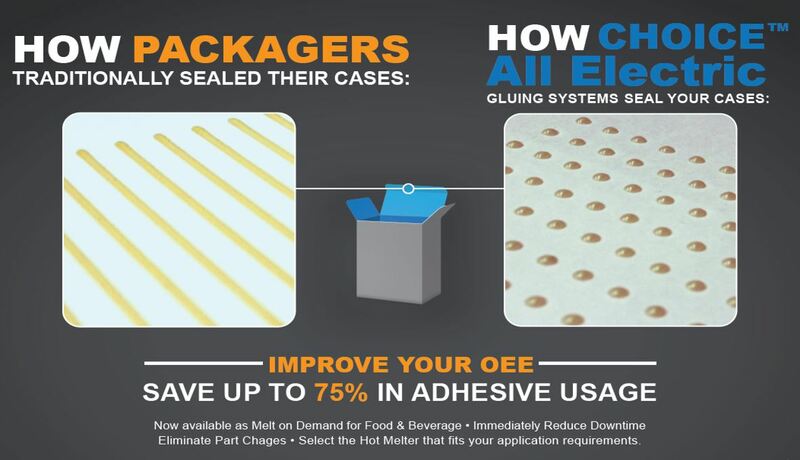 This all-electric hot melt solution nearly eliminates all maintenance and performance concern associate with traditional adhesive systems. Instant Payback: The system pays for itself in as little as 4 months of use following install. Material Savings: The All-Electric solution allows you to use “stitch mode” to apply minimal adhesive beads with no stringing and a perfect bond. We have proven a 40-60% reduction of adhesive usage in every install. Less Downtime: Electric gear pumps and electric valves remove almost all seals typically required to run a pneumatic system. This reduces the chance of failure created by too many moving parts. Safer Operation: Electric hot melt systems require lower pressure settings than pneumatic systems for a safer work environment. Eliminate Clogged Nozzles: Functionally eliminate clogged nozzles by working at lower pressures with larger nozzle orifices. The EcoStitch is ideal for applications for high line speeds, fast cycle rates, and long service life. Electric valves allow you to use a ‘stitch’ mode to apply minimal adhesive beads with virtually no stringing to guarantee an extremely accurate application, even at the highest line speeds. The EcoStitch™ valve easily reaches 3000 cycles per minute continuous duty and has a cycle lifetime of up to 300,000,000 cycles. Paired with a Valco Melton pattern controller, you are able to customize patterns to optimize efficiency and reduce adhesive consumption by up to 75%. This All-Electric hot melt system is suited for a range of packaging, paper converting, non-wovens, and product assembly industries. Specific applications include spray, ribbon coating, direct contact, and high-speed jetting adhesive dispensing guns. A positive displacement, motor-driven gear pump offers a continuous pulse free output. Solid-state controls, precise RTD temperature sensors, and thermostatic temperature control optimize system performance. 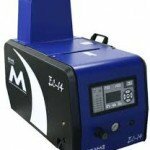 All melt units feature an easy-to-use touch pad with a bright LCD screen which allows operators to quickly setup system parameters and monitor system operation with no confusing codes. Easily adapted to variable speed applications. Independent control of each heated zone (up to 16) minimizes adhesive degradation and provides precise, uniform patterns. Teflon® coated tanks reduce char buildup for easy maintenance and reliable operation. Valco Melton’s latest innovation, this tankless hot melt adhesive system was designed to melt glue as you need it. This simple, yet revolutionary concept, eliminate maintenance and downtime due to charred or ‘over-cooked’ glue. Engineered as an enclosed system with an integrated auto feeder, the KUBE is very reliable and nearly impervious to any production environment. Multiple mounting configurations allow for easy retro-fit integration and installation on virtually any industrial packaging line. This product is available with an all-electric gear pump or a more traditional pneumatic, piston pump. Valco Melton has been a leading supplier of cold adhesive dispensing systems to the packaging and converting industries since 1952. VanSco, a division of Valco Melton, is a complete line of high-speed liquid glue adhesive systems specializing in: Carton Folding, Corrugated Converting, Palletizing, Tobacco Packaging, Direct Mailing, Book Binding and More. Noted for it simple and efficient design, VanSco adhesive systems have an extremely long life-span and provide consistent, high-speed performance with nearly zero maintenance.